Take part in this exceptional 5 days Uganda gorilla safari taking you to the excellent Queen Elizabeth national park for game drives and Lunch cruise at kazinga channel, and the famous gorilla trekking in Bwindi impenetrable forest national park. Bwindi is a home to the highest population of mountain gorillas in the whole world, roughly half of the total population. the tour starts in Kampala Uganda and ends in Kigali Rwanda. Begin your Uganda safari with an early breakfast and pick up by our tour guide from your hotel. Drive to southwestern Uganda with lunch en route in Mbarara. Arrive in Queen Elizabeth national park in the afternoon. Overnight stay at Mweya Safari Lodge (luxury)/Park View Safari Lodge(mid-range)/Enganzi Lodge (budget). Day 2: Game drive and boat cruise. 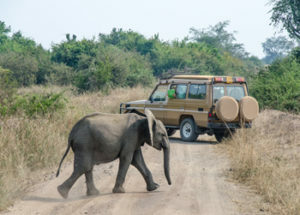 Begin your wildlife experience in the park very early in the morning with game drives along the Kasenyi trail. Expect predators including lions, leopard, Jackals, etc. and herbivores such as waterbucks, elephants, buffaloes, and different antelope species. In the afternoon a boat cruise along the Kazinga Channel will make the biggest highlight in this park. Dinner and overnight at Mweya Safari Lodge (luxury)/Park View Safari Lodge(mid-range)/Enganzi Lodge (budget). 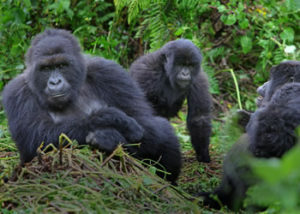 Gorilla trekking, being a strenuous activity, requires you to eat a heavy breakfast and taking along some packed lunch. At 7:30 am, all trackers assemble at the park headquarters for a briefing from the park warden, and at 8:30 am they all transfer to the starting points of the different gorilla trails. 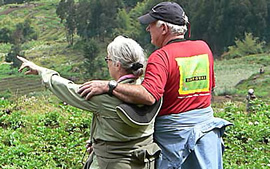 On return, your tour guide will transfer you to Kigali – Rwanda. Dinner and overnight stay at Mille Colline Hotel (luxury>/Frame tree village(mid-range)/Five To Five(budget). After breakfast, your tour guide will take you around the city for handicrafts shopping in the local market, visit Gisozi Genocide Memorial site, lunch, etc. In the evening your guide will transfer you to Kigali airport for your scheduled flight. The 6 Days Uganda Gorilla safari takes you to Bwindi national park, Kibale national park for chimps trekking & Murchison falls national park for great views of the waterfall.